I'm doing a little research for a drawing I'd like to make of St. Francis receiving the Stigmata. I'm trying to see if there's a traditionally accepted iconography...figures, objects, postures, symbols, etc. that help tell the story, teach sound doctrine, and are consistent throughout Catholic art. In each, there are definitely similarities. 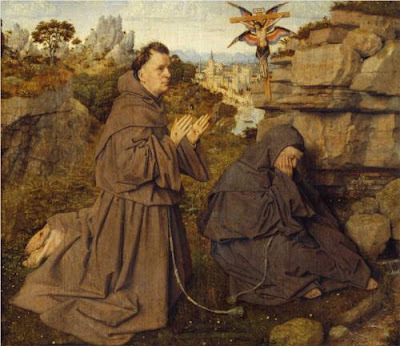 St. Francis wears the Franciscan habit of course, he is generally kneeling, displays Christ's wounds in his own praying hands, and is confronted by a vision of a 6-winged seraph bearing a crucifix. The differences are striking as well. Giotto is painting during the Gothic era, and his image bears a Byzantine influence common to Italian painting at that time. St. Francis and Christ look almost like icons against a guilded background. But the figures move in space, and there is a suggestion of landscape. Jan Van Eyck's work exists on the border of High Gothic and the Northern Renaissance. The folds in the saint's habit are magnificently angular and stylized, and the proportions of the figure are a bit awkward, but everything is rendered in crisp, exact detail. While Giotto's Francis has his arms spread wide with a bold desire to embrace Christ who is nearly swooping down on him, Van Eyck's Francis holds his hands in a more calm, private gesture. The primary reality is the world around him, and Christ seems by comparison very small and almost out of place. However realistic, his work is still symbolic, using imagery that suggests Christ's suffering in the Garden of Gethsemane. El Greco's Francis seems to float in a darkened world. The reality of heaven breaks in upon the darkness and pours light over Francis who greets his Lord with a devoted expression. Art historians argue over whether El Greco's works display a bit of Byzantine influence as well, but we do clearly see a Mannerist influence in his elongated figures and the overall ambiance is definitely Baroque; the style of the Counter-Reformation. From this exercise I can get a better idea of what details are essential to illustrating this episode in St. Francis' life, and what different emphases and emotional responses can be communicated through different styles. Though I've normally a big fan of Van Eyck, I think his version is the weakest. I love Giotto's idea of St. Francis embracing his wounds with wide open arms, and practically getting bowled over while being zapped with heavenly light. It really gets close to the spirit of that great saint and his radical love for Christ. 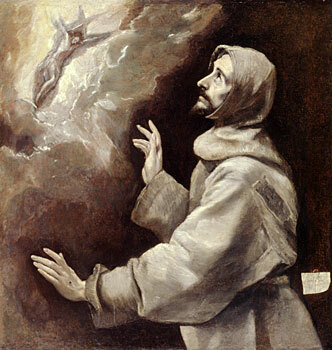 I also love El Greco's dramatic rendering...here I think we get closest to the nature of St. Francis' vision. The world melts away and he is entranced by the Lord.